Several issues ago in SatMagazine, we wrote that Ultra-HDTV (U-HDTV) is coming... and fast... were the precise words used in that column. Well, it seems we were wrong. Ultra-HDTV (U-HDTV), at least in its 4K version is, in terms of satellite time, now just around the corner. DigitalGlobe and GeoEye are due to complete their merger in 2013. Has the 3DTV wave crested? From what I saw at the IBC show and at SATCON 2012, Id say so. NOBODY was talking about 3DTV. The buzz was about the far more lifelike images produced by the 4K (twice the number of pixels as todays HDTV) technology on display. The same display manufacturers who overhyped 3D are marketing 4K displays under the Ultra HD moniker. The difference, though, is that this really is worthwhile. Absolutely stunning images that wont have you stumbling into your furniture wearing those goofy 3D glasses. And some really HUGE displays! What could be bigger than that? All of the new Ka-band satellite systems entering the market have prompted fevered comparisons between the Ku-band platformsthere has been, and continues to be, much debate about which of the two technologies provide better service to customers. The big tent of the Pacific Telecommunications Conference will again be pitched at the Hilton Hawaiian Village hotel campus in Honolulus Waikiki section between January 20 and 23, 2013. Those who have attended PTC 2013 in the past know that this conference is unique not only for its setting, but also for its effort to bring together senior level executives from all parts of the satellite, fixed and mobile telecommunications, IT and broadcasting industries to talk about issues that impact them all, often in different but interrelated ways. Thus, the big tent metaphor works, as it provides a shelter for all sectors to mingle in a way that is unique in our increasingly specialized sectors. If theres one thing that makes the space industry profoundly different from most other industries you can think of, it is the passion that each and every one of us brings to our job, day in and day out. Futron Analysis: 2012 Space Competitiveness Index, Today, space has been transformed from an object of wonder to an arena of practical, economic, and strategic consequence. Exploring the vast unknowns of space is an ancient human aspiration. The battle for control of the maritime and aviation markets is no longer just a skirmish. Its now apparent that Intelsat means business in its attempt to wrestle maritime and aviation market dominance from Inmarsatand Inmarsat is fighting back. Those who followed the October 8th GX Investor Conference and its aftermath found themselves witnessing a battle of conflicting claims and counterclaims between the two communications giants. The origins of satellite navigation date back to the late 1950s, when the U.S. Navy began to develop the Navy Navigation Satellite System (better known as TRANSIT), which became known as the worlds first global navigation satellite system (GNSS). TRANSIT, and its successorsthe U.S. Global Positioning System (GPS) and the Russian GLONASS systemwas originally designed to serve military needs, but later evolved to serve civilian purposes as well. This sparked the formation of a rapidly developing GNSS industry and has made possible the development of a variety of different GNSS applications. Specifically, car and personal navigation devices as well as location-based services in the form of various smartphone apps have made GNSS a part of our everyday lives. Best Practice Recruiting should include an original approach, the focus on building trust with the talent, the determination to hire the best candidate and an opportunity for the employer to be favorably represented in the marketplace. At the time of this writing it is predicted that by November 1, 2012 we will witness 142 spacecraft involved in 78 launches. This tally includes seven satellites deployed from the International Space Station. As to their purpose, an analysis is provided in the two tables on the following page. Survey: The Size + Health Of The United Kingdoms Space Industry, Its findings will provide a crucial insight into how the sector has fared and also provide a guide as to where companies are experiencing difficulties and barriers to growth. The 2012 Size and Health of the United Kingdoms (UK) Space Industry survey represents the latest incarnation of the key biennial barometer of the UK space industry. The UK Space Agency contracted Oxford Economics to conduct this edition, covering the years 2009/10 and 2010/11; Oxford Economics also conducted the 2010 survey. This document presents an executive summary of the findings. 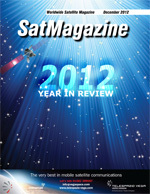 Year in Review 2012: Part V, Marlink  ND SATCOM  Newsat Limited  Newtec  Norsat International Inc.
Marlink ND SATCOM Newsat Limited Newtec Norsat International Inc.